Acting University of Hawaii President David McClain, right, and the Board of Regents listen to grievances yesterday from Jon Osorio, director of Hawaiian studies, during a meeting at the Campus Center on the UH-Manoa campus. University of Hawaii regents questioned the lack of supporting receipts when the UH Foundation paid former President Evan Dobelle's credit card bill, including personal expenses, from his protocol account. A Page A1 article yesterday incorrectly said the regents questioned why his bills were submitted without "proper documentation." Dobelle did submit a spreadsheet outlining personal and business expenses, which was considered adequate by the foundation. Ousted University of Hawaii President Evan Dobelle says he cannot understand why the Board of Regents fired him. Dobelle, calling from Chicago where he is vacationing with his family, said last night that before he came to Hawaii, he had three highly successful university presidencies and enjoyed good relationships with the boards. "It cannot be about me," Dobelle said about his rocky relationship with the UH board. "I don't know anything other than the fact (that) maybe my biggest problem has been my success," Dobelle said. "I have never been in a situation where everybody doesn't want me to succeed. "A lot of this has to do, in my opinion, with control and autonomy," Dobelle said, noting he tried to exercise autonomy as university president. He suggested lawmakers and others tried to stop him. Dobelle said it is "conceivable" that his firing could have something to do with his endorsement of Gov. Linda Lingle's opponent, Mazie Hirono, in a television commercial just before the November 2002 election. Board Vice Chairwoman Kitty Lagareta responded that the vote to fire him was unanimous, with appointees of both Lingle and former Gov. Ben Cayetano supporting it. "There was no politics in it," she said. Dobelle said his immediate plans are to continue his vacation, taking his son to visit colleges, and return to Hawaii on Monday. Dobelle also said he will call the Urban and Regional Planning Department, where he has a tenured faculty position and expects to teach classes this fall. "I'm excited about teaching," he said. He said he will also call Walter Kirimitsu, UH vice president for legal affairs, and ask him about what is happening with his job and severance pay. 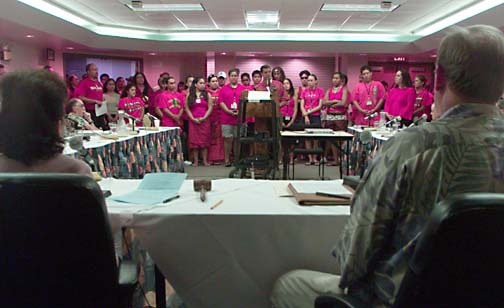 UH regents fired Dobelle as president "for cause" Tuesday night after an all-day meeting. The phrase is important because it means he would not be entitled to a $2.26 million severance package. Dobelle's contract is specific in defining "cause" as a conviction for a felony offense, mental instability or conduct that brings public disrespect, contempt or ridicule upon the university. Regents said because of legal advice, they could not yet say why the president was fired for cause, and referred questions to Kirimitsu. They said they hoped to be able to release more information soon. One factor in the decision to fire Dobelle is a still-secret audit of Dobelle's $200,000-a-year protocol fund, which is provided by the charitable University of Hawaii Foundation. Earlier this month, regents questioned UH Foundation Chief Financial Officer Bill King about Dobelle's spending and reimbursements from the fund. Regents asked why Dobelle was allowed to submit his credit card bills to the foundation without showing which charges were for business and which were personal and without submitting proper documentation. Copies of check reimbursements obtained by the Star-Bulletin also showed it took months, and in one case more than a year, for Dobelle to reimburse the foundation for his personal charges. Yesterday, Dobelle said he could not imagine anything about the protocol spending that could rise to the level of "cause" for termination as defined in his contract. "It (reimbursements from the protocol fund) is just not something that I deal with," Dobelle said. He said his secretaries handled his paperwork, and blamed problems with reimbursements and delays on "messy bookkeeping, based on the foundation side and the staff side." Dobelle said it was not his idea to reimburse his entire credit card bill. He admitted to "occasional mistakes," such as going out to dinner with a friend who happens to be president of a company, but noted "it might work in reverse," where he was not reimbursed for a business dinner. "Ultimately, you catch up," he said, noting that he has sometimes had to wait months for his reimbursements from the fund. He said the foundation funds involved no tax dollars and that "there's no intent on behalf of anyone." Dobelle said he still has not been officially notified that he was fired. He said he learned the news when he went online yesterday morning to check his e-mail and look at online news. "It was a real wake-up call," he quipped. Dobelle said regents called his wife, Kit, at midnight Tuesday. "'If this is urgent, is something wrong?' she (Kit) said. 'Is somebody hurt?'" Dobelle said. "They never told her why they were calling other than it was urgent." Lagareta said the regents left messages for several hours for Dobelle and that they finally sent a night manager up to his room. She said when Kit Dobelle called back, she was evasive about where her husband was. Dobelle and Lagareta also disagree over whether Dobelle scheduled his vacation after being notified of the meeting on his evaluation. Dobelle said he had been planning a college tour with his family for years and notified the regents 2 1/2 months ago of his plans. Lagareta said the board moved its meeting from its normal dates of today and tomorrow to Tuesday and yesterday at Dobelle's request and that the former president informed them later that he would be on vacation. She said board members also told Dobelle it was important that he attend the meetings. "I've just never experienced this kind of situation before," Dobelle said. "I come from a world where you deal straight with people." If the regents had a problem, they should have come and talked to him about it or written to him, Dobelle said. "I can't imagine why the board would want to have a public clash," he said. "You don't try to dirty somebody up. I gather that that's the kind of politics that exists in Hawaii for a long time." Dobelle said he is proud of what he has accomplished and grateful for the "amazing" support he has received since he was fired. "I've done the right thing by the university," he said. "Everything we've done has been extraordinary. I'm not being boastful. I'm not spinning the story."